In mid-February, it’s nice to dream of the turquoise waters and whitewashed buildings of the Mediterranean. The city of Altea in Alicante, Spain, is on the Costa Blanca. The historic town, slightly inland of the current community, was under Moorish rule and was then conquered by Christians in 1244. Altea’s palm-fronted beaches have made it a tourist destination since the 1950s, and it still features a historic part of town with winding cobblestoned streets. Its most prominent building is the blue-and-white tiled dome of the La Mare de Déu del Consol or “Our Lady of Solace” church. The late 1960s were a formative time in Clark Hulings’ easel painting. We’re seeing a decade that began with a few illustration projects and several years of watercolors, emerge into the oil-on-canvas structured compositions with evocative subjects and the complex play of light that now characterize his work. Altea #1 – Street Repairs is from 1968, and you can see the white buildings in the heat of mid-day. The greenery of the vines and in the pots on the balcony provide at least a visually-cooling element. 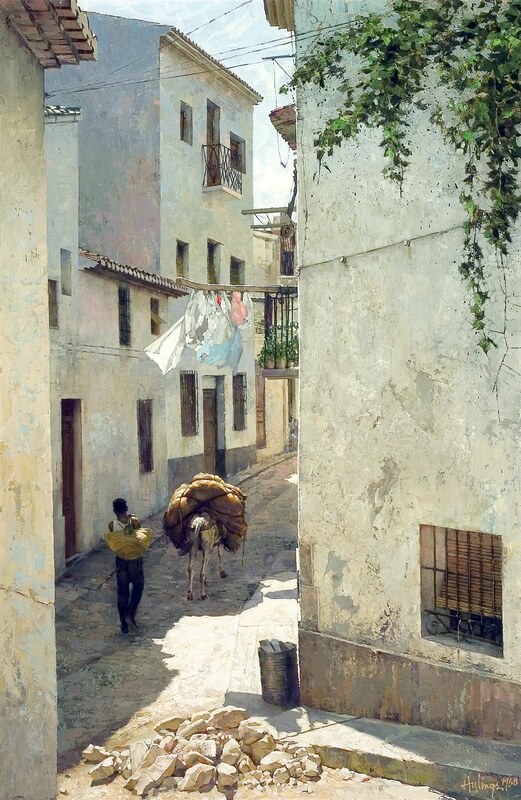 This is a particularly tall, narrow painting, making the close streets of the old city seem even tighter. The edges of the two buildings create yet another, even more narrow vertical corridor, directing our attention to the scene within it. Blue, white and pink laundry fly above, with — you guessed it, Hulings connoisseurs — a tiny red accent to bring our eye down to the action. A young man with a woven bag walks away from us, and his white burro is doing the heavy lifting, carrying a huge pack. Both are in the shadow of the buildings, where it’s likely a few degrees cooler. But wait: what just happened? There’s a big pile of stones blocking the road. One of many reasons why Clark Hulings had a successful transition from illustrator to easel painter (although he had never stopped being fine artist throughout the illustrator and portraitist years) was that he understood the fundamental difference between handing the story to the viewer fully-formed, which is usually required in commercial work, versus skillfully putting elements in play and allowing us to have our own “aha” moment of discovery of the story — which is more the work of a fine artist. In this painting, the “Street Repairs” part of the title, the rectangular composition, and the way the light falls right on that pile of rocks in the foreground, clues us into the make-your-own story element of the piece: How did these two make it over the roadblock? (It may remind city folks in 2018 of being delayed in our cars or on the subway because of perpetual construction!) The event has already happened, and Hulings has dropped us into the scene at the epilogue. In any case, the two are now on their way again, going about their business as we all do after a setback when we need to keep the day moving.